Police in Manchester have appealed for anti-war protesters to make their demonstrations peaceful. The plea came after several people were arrested during protests on Friday. 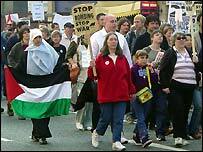 On Saturday afternoon up to 1,500 protesters marched through the city centre to voice their opposition to war in Iraq. Police said they had made no arrests. The protest was one of a number of marches organised by the Stop the War Coalition. The demonstration came after police made a number of arrests on public order offences, on Friday. Sixteen people were arrested during a morning rush-hour protest in Princess Parkway, Hulme. Traffic was also disrupted in Fallowfield during the evening rush-hour, as taxi drivers drove slowly to protest against war. Further arrests were made during a protest that blocked Princess Road in Hulme for a time. Assistant Chief Constable Rob Taylor said: "We recognise people's right to peaceful protest but must give safety the highest priority and ensure the rest of the community can go about their business unaffected." He said any attempts to cause widespread disruption to the public or carry out illegal activity will be swiftly dealt with. "We are continuing to develop our plans to deal with any eventuality or events throughout the weekend," said Mr Taylor. "I would urge people to ensure demonstrations pass off peacefully and ask for their continued support."